Is there more pressure to prove yourself in your second film? I was a wreck during SOTY because of its sheer scale and the thought that I was doing a Karan Johar film. Being an outsider, the whole experience overwhelmed and distracted me. I feel I was far more focussed and relaxed in my second film. I would like to believe that it is a more well-rounded performance. If I pullA� offA� this and my next film (Villain) this year, then I think I will prove my mettle as an actor. What do you think is the USP of your pairing with Parineeti? I think our chemistry onscreen worksA� and our director, Vinil Mathew, incorporated what he saw of our personalities into the script. The USP is how two odd people with different characters are so sweet together. Vinil is not portraying us as aspirational, but as two odd characters. What are you enjoying most about stardom? This industry gives so much back: you get recognised, feel special, lucky and blessed. It has made me more humble because I was not expecting this. Though it has made me more relaxed, content and happy, I have also become less complacent. Working hard comes with every job and I have to live up to my launch, which I am prepared to do. What is the downside of fame? You get less and less time for yourself and have more pressure to perform as a human being because you have to be nice to everyone a�� from a stranger on the road to a big director. You have to be careful not to offend anyone, and perform even when the camera is off. 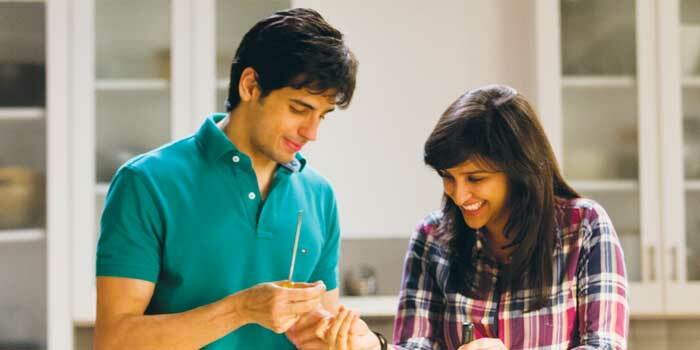 Tell us about your role in Hasee Toh Phasee. I play an exciting rolea��that of a mad, quirky scientist named Meeta Solanki. She is brilliant and intelligent, but she is mentally off. It was interesting to play this role because we havena��t done a scientist for a long time in Bollywood. You are constantly compared to Alia Bhatt. I dona��t think people should compare us at all. She has done just one film and she is going to do some tremendous work now. I predict shea��ll be one of the biggest stars in the industry. Tell us something we dona��t know about Sidharth Malhotra. He uses way too much lip balm. I got along really well with him because I use a lot of lip balm, too (laughs). On a serious note, he is a very nice person, very chivalrous, and a great actor to work with. There is no one. I like to use my brains for everything and not follow anyone specific. Tell us about your upcoming movies? After Hasee Tho Phasee, I have Daawat-e-Ishq with Aditya Roy Kapoor, and Kill Dill with Ranveer Singh. What are the pitfalls of stardom? Other than your privacy going for a toss, stardom is a great thing to have. Who does not mind having the spotlight on them all the time! How are you with social networking? I am pretty active on Twitter to keep my fans updated about my roles. But people are constantly talking about your clothes or what you said, and this tends to affect a person physically and mentally. 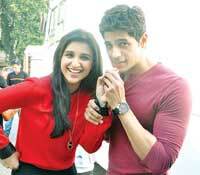 Hasee Toh Phasee is scheduled to release on February 7.